Speculative Silver Positions Blowing Out To Extremes. Is This Time Different? - Speculative gold positions were subdued for the week but the change didn't include the late week surge in PM prices. - Speculative silver positions hit an all-time high above last week's record level and that didn't even include the late week silver price surge. - Investors need to be careful here as investing when speculative positions blow out is usually not a recipe for success. In the latest Commitment of Traders report (COT), we saw a slight decrease in both speculative long and short gold positions BUT this report closed on Tuesday when the gold price was $1241.70 - about $50 less than Friday's closing price. That means that the data we have for gold positions is pretty stagnant (don't get us started on why the COT doesn't publish more recent data) and it suggests that speculators are significantly longer than the report shows. 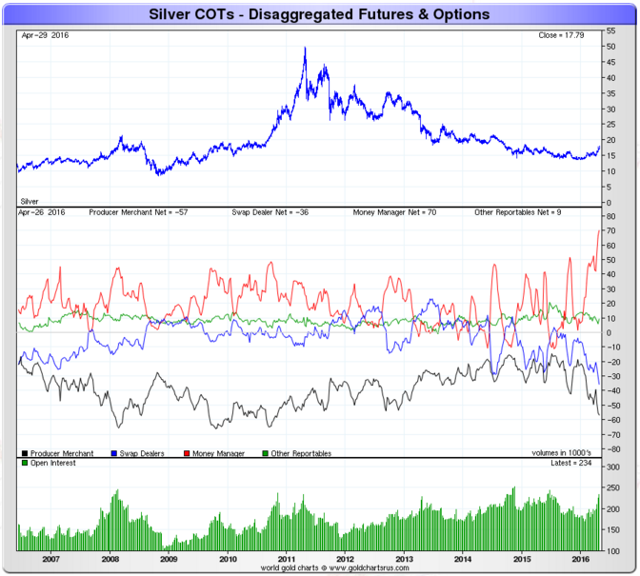 More interesting though is what is going on with speculative silver positions, which have completely blown up! Despite silver closing at $16.95 at London's close on Tuesday, which is around a dollar less than its current price, speculative silver longs surged to a new all-time high. 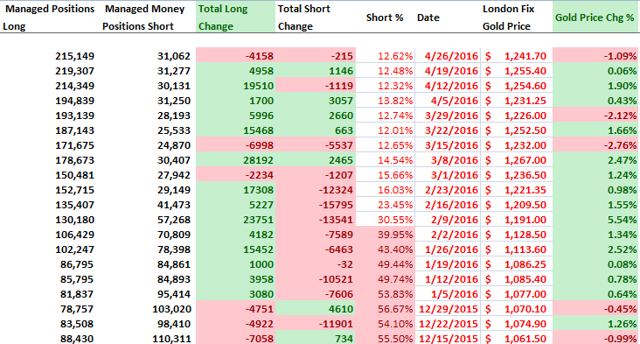 This week's report shows minor decreases in both speculative long and short interest. While the report shows a minor change in speculative gold positions, as we stated earlier it is a bit deceptive as it doesn't include any of gold's surge on Wednesday, Thursday, or Friday. 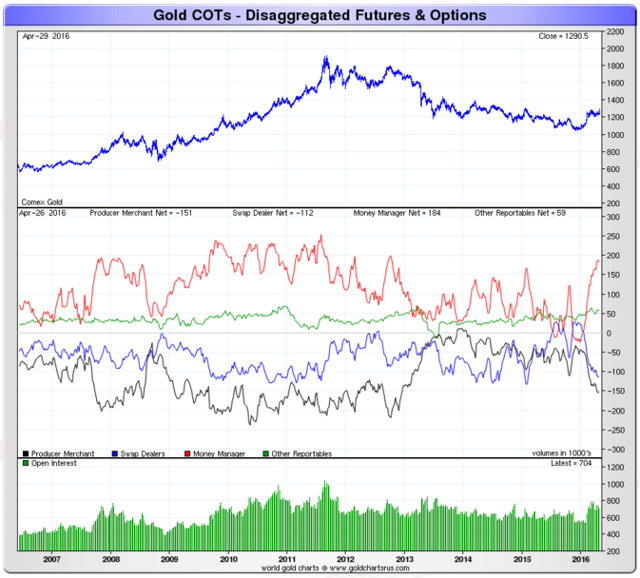 The fact that gold is $50 higher than the value as of the COT close suggests a much higher gold position. The net speculative gold positions (money managers represented by the red line above) are moving closer to all-time highs despite a flat week as of the report's close. In fact, we are at a net speculative position last seen in late 2012 - when gold was over $1700 per ounce. That red line is the net speculative positions of money managers which have surged past 70,000 contracts net long to a new all-time high above last week's high. 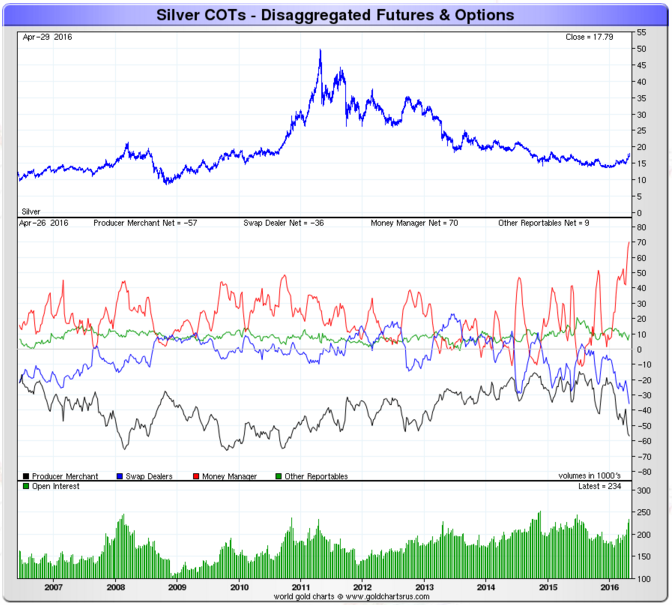 COT report money managers have never been more bullish on silver and we are way above levels we saw in 2011 when silver was close to $50 per ounce. Not only that, but this report closed on Tuesday when silver was under $17 per ounce and it is now a tad below $18 an ounce as of Friday's close. Thus a great chunk of position changes were not included in this report - we're probably significantly higher than the 70,000 net long positions shown in this report. We sound like a broken record as we think investors need to be EXTREMELY cautious here as historically it is usually a bad move to buy when animal spirits are so excited - and they certainly are based on these positions. But we always like questioning our positions and think of why we may be wrong here - what could continue to make gold and silver surge? There is a physical shortage of silver and this is the start of a rebalancing of the market at much higher prices to facilitate new silver production or investor sales. Investors are tiring of central bank jawboning and are seeing the handwriting on the wall suggesting that central bankers simply cannot raise rates. The massive amount of money printing has resulted in a ton of money sloshing around in the financial system, and it is now commodities' turn to spike as they are the new "in vogue" financial asset. We are seeing the first signs of inflation as commodities sense a true exit from the deflation of the past decade. Demand for commodities is returning as the economy recovers and after the cuts in production over the past few years that demand is being reflected in improved pricing. We would love to hear other thoughts in reader comments below, so feel free to share your opinions on why gold and silver are spiking. As for us, despite these potential explanations and our long-term gold bullish expectations, we believe that this is not the time to be buying gold and silver despite the spike. Of course we may be wrong, but we hold that this spike is all about speculative cash joining the hot new momentum trade of the past few months. That is why despite the all-time highs in the net speculative position we are not seeing new all-time highs in the gold and silver prices - because the physical side of the market isn't strong enough to support the prices. In 2011 we had a convergence of both speculative and physical investors buying gold and silver, but now we simply aren't having the physical side jumping into gold or silver with full force. Until we have that (or a financial event that causes that), we don't think this surge will continue. As we have stated before, we recommend investors deal with this investment environment by lowering risk and taking profits while waiting for speculative long liquidations, more chaos in the financial markets, or a drop in gold and silver prices. Thus we are holding off on increasing gold positions in ETFs and miners such as the SPDR Gold Trust ETF (NYSEARCA:GLD), iShares Silver Trust (NYSEARCA:SLV), ETFS Physical Swiss Gold Trust ETF (NYSEARCA:SGOL), Tahoe Resources (TAHO) and Randgold (GOLD) - we are waiting for a better entry point that we think will come over the next few months. We may be wrong here but we think it is not a good time to jump into the gold and silver market - the reversal could be sudden and extremely vicious.